This darn chest cold still has a grip on me so I'm making the most of it by having a guilt free pinterest marathon. I spotted this little twig tree on one of my daughter's boards and thought it might be a diversion I could handle. I gathered up a few twigs. I then started tying on ribbon without looking at the original sample again. Turns out I was a little skimpy with the number of ribbon branches I added. So my trees have that Charlie Brown effect. I made a few little tags to hang from the bottom of the tree. My idea is to use these as hand delivered Christmas cards for a few friends in the neighborhood. I attached these to the tree with a thin wire wrapped in brown paper. I love this stuff. I use it for attaching prices to garage sale items where sticky tags won't hold. And it seems to come in handy on almost every craft project I attempt. The twine at the top of the tree is wrapped around the twig and secured with hot glue. I used a dab of glue on each vertical extension to keep the twine from flipping and twisting. These went together rather quickly so I think I will make a couple more. 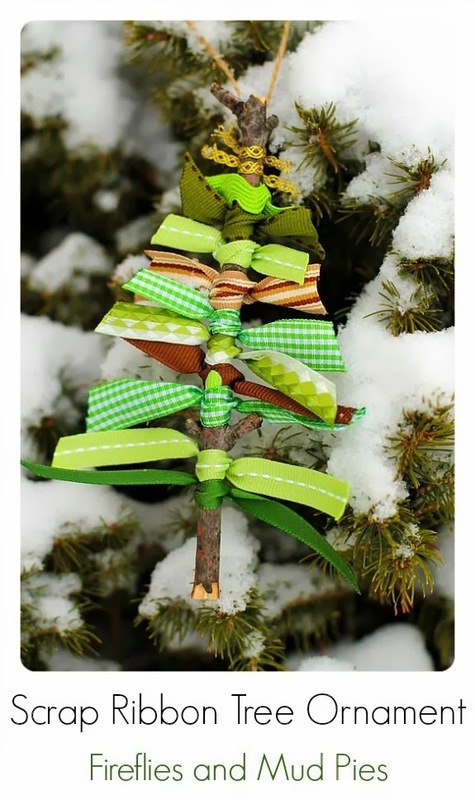 The point of these is to use ribbon scraps. I can't say these were all scraps but I did use ribbon I had on hand. However, I think it would be fun to pick up more ribbon with this project in mind. I am now thinking of attaching them to the outside of presents as a gift tag. Each ribbon behaves a little differently. I think you have to let the ribbon have it's way or it will drive you crazy. Again, a simple little project gets out of hand. I seem to be addicted to getting that one, perfectly delightful twig tree. Another monster has been created. And the mess is spreading from one flat surface to another. The nice part is that earlier this year I organized some of my supplies and that is paying off. I really should clean up that mess and stop with these twigs. OMG, I just found more ribbon in the studio. I think cabin fever is creating irrational behavior. I am off to browse pinterest and take my mind off crazy but cute little twig trees. PS: Almost got my mind off the twig trees, but I couldn't resist a couple more. I decided they would be cute with a gift card hanging from the bottom.